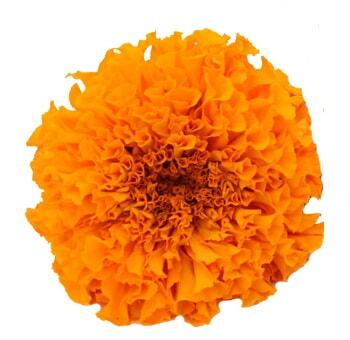 Marigold contains pale to medium green leaves, it also has yellow and orange colored flowers (among other colors) on long stems that reaches a height of about 1 to 2 feet. It was once considered the most sacred of flowers and used to adorn holy statues of the gods of the Hindu world. It is a very cheerful flower and similar to the gerbera daisy and Calendula. They have a limited season, stretching from September thru December. It is a perfect flower for weddings and special events. The Calendula blossoms are some of the most versatile and beautiful flowers. Easy to grow and perennial they belong to the daisy family. These beautiful blooms have a broad range of uses since the olden times. They are even always in demand, so cultivators came up with a wide variety of colors and hybrids. These blooms are increasingly being used in special events and weddings. Their fantastic range of colors makes them very easy to be a part of various themes and arrangements. Calendula or pot marigolds are some of the most amazing flowers you will come across. Used mostly in garden beds, these even make lovely cut flowers. Surprisingly they are also edible. The petals of this flower can be used to add color to the rice. Another fantastic use of this flower is being made in the beauty industry. Many cosmetics, lotions, creams and hair colors are made from Calendula.Other names of this plant are Common Marigold, Garden Marigold, Ruddles, English Marigold and Scottish Marigold. They come from the Daisy Family although it may seem like they come from the Marigold genus. It's a very hardy plant. And you can even call it a traditionally used herb. However, over a period, it has been started cultivating for its beauty. Various sunny shades of yellow, orange and even white calendula flowers can lighten up any décor.Calendula can be grown almost anywhere as long as there's sun. According to gardeners and horticulturists, it's one of the easiest and low maintenance to grow especially because they tolerate almost any soil. All it needs is well-drained soil, full or bright partial shade and some between seeds. Leaves of this plant are green rosettes that are alternate, stalked or stalkless, and spirally arranged. Some are even slightly hairy, but the coveted golden flowers are extremely beautiful and make up for the lack of attractive foliage. The Calendula pot Marigold flower has been a part of the world's culture for a very long time. It's old-fashioned and traditionally used as a herb. At best the pot Marigold takes on an amazing saffron color which is the closest substitute one might find of the esteemed spice. Because of this, it's been used in many dishes, especially when adding color to the rice. The only downfall is that in large quantities the flower tends to taste rather unpleasant. The beauty industry has discovered the uses of this plant too. But it’s not something new. The uses of these flowers for dying hair dates back to the time of the Vikings who dyed their fair blonde hair golden. Today, many lotions, creams, masks and hair products are made by inculcating these flowers. In Ancient Greece and Rome this flower was used in medicine. The delicate plant can heal small wounds, itches, eczema, insect bites, and callouses. The flower has also been used to dye textile, and since the flower has some essential oils, many perfumes have been made for their scent as well.The calendula pot marigold is a really fragrant and beautiful flower. Their uses are many, and they are highly appreciated for their versatility when it comes to that. There are even white and purple calendula blossoms available now. These hybrid varieties are specially cultivated for the cut flower market. As a cut flower, this blossom is amazing for ornamental use in special events and weddings. Many brides opt for these lustrous blossoms not only for the bridal bouquets but also the wedding aisle and altar. Without a doubt, these beautiful blooms would have all eyes on them. The orange and apricot calendulas are absolutely perfect for spring and autumn Ed themed wedding. They even help in creating the coral look some brides are looking to create. The blooms make amazing centerpieces as well. The yellow calendulas blossoms make great centerpieces as well. The bright blooms are perfect for summer weddings or barn and farmland wedding venues. The beauty of this cut flower is exactly in the fact that they are extremely versatile and easy to blend with any themes. Bridal bouquets too can be given an elegant and soft splash of colors by using purple calendula blossoms. There are white candelas available as well for brides opting for a more classic white bouquet. Calendula flowers are short-lived perennials. However, due to the availability of the flower in so many colors and hybrid varieties, the demand for them has only increased. That's why finding these amazing flowers will actually be pretty easy.But if you plan to purchase them in bulk, you will have to contact a wholesaler. Many wholesalers keep calendula flowers for sale however instead of running around you can try online wholesalers like Whole Blossoms. There are a few things that you should ensure before purchasing flowers in bulk online. First is the quality, freshness, price and delivery system. Whole Blossoms is a trusted online wholesaler that check marks all of these. In fact, they even have a 24/7 hour delivery service which delivers fresh flowers right at your doorstep. This is a life saver for event planners or events that are being planned in an urgency. However, we highly emphasize that you make your purchase from good online wholesalers that absolutely guarantee a fresh flowers delivery!